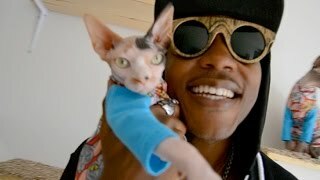 If you’re contemplating raising your kids without any pets in the home, you should know that one could turn out to be a man who raps about cats. I say this not in the spirit of offering a cautionary tale. Heck, just the opposite. Don’t get me wrong. I would never lobby for an animal-free household, which I think yields a parade of missed opportunities, not least the chance to plant in children the seeds of compassion and empathy. Sometimes, though, going pet free in one’s formative years can later prompt overcompensating of one kind of another—which, in turn, can produce some enchanting and distinctive results. 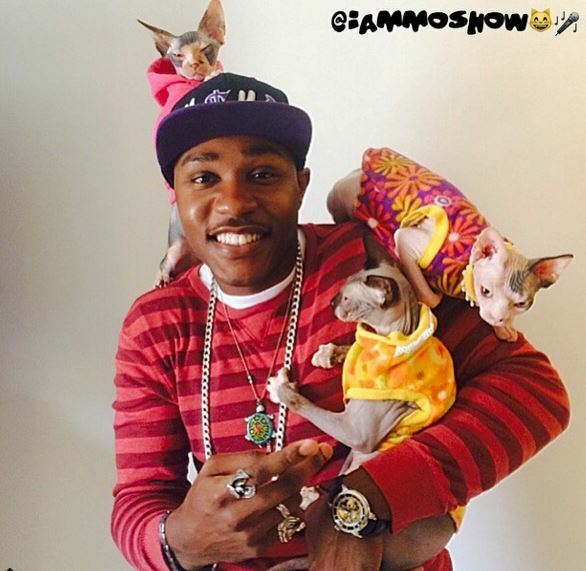 Take, for instance, Moshow—the man who raps about cats, often in videos that go viral, elevating him into something of an Internet sensation. In a March Talking Animals interview, Moshow said, “I grew up without any animals my entire life,” a statement carrying a light dusting of hyperbole. By “my entire life,” he means his childhood, before he went to college. But not long after he trundled off to Pennsylvania to step into the world of higher education, he met a girl—and he met Queenie, a pivotal figure in Moshow’s transition from the animal-free zone into passionate feline fan. His girlfriend “had a black cat named Queenie that she’d had since she was like 10 years old,” he recalled. “When I would study, Queenie would sit downstairs and look at me studying. He certainly made up for lost time, for all those years of pet deprivation. He now shares his Portland, Oregon, home with four cats—Ravioli, Sushi, Tali and MegaMam; the last three are Sphynxes, hairless cats with an otherworldly appearance. “I grew up in the projects in Baltimore,” the man born Dwayne Molock explained, “and I’ve always felt like I was the oddball: when everyone else was on the corner, wanted to be in the house, listening to Daft Punk, in my own little world. Kind of like an outcast. “So when it came to the Sphynx, they’re not that popular kind of cat. Sphynxes aren’t the kind of cat where people say, ‘I want a Sphynx.’ It felt like Sphynxes are the outcasts of the whole cat world. Moshow gives his cat a bath. Anyone who’s ever seen a Moshow video might wryly observe that saying the rapper and his cats “click” would constitute an understatement on the order of suggesting there seems to be a touch of chaos in the White House. These cats love this guy! Whatever else is happening in any given video, one or more—or all four—of the cats are perched on his shoulder or head, or crawling around on them. Like they just can’t get enough of their rapping companion. Within the Moshow phenomenon, there is the cat phenomenon—maybe it’s more accurate to say the latter helps account for the former. But what, exactly, accounts for the cat phenomenon? This feline passion seems singular. If you’re starting to discern Moshow is an uncommon fellow, you’re reading the message loud and clear. And that ain’t the half of it. In conversation, he bounces between jocular self-awareness, surprise at the level of attention the cat videos have generated and the occasional jarring disclosure. That may seem at odds with a man who’s become a popular rapper, and began rapping as a teenager. But Moshow recalls that he was at odds with his rapping back then. He’s pretty clear now on who he is: A guy who adores his four cats, and vice versa, and when he posts a video of himself rapping while, say, sitting in the bathtub giving Ravioli a bath, it’ll rack up nearly two million views. And a bathing-cat sequel clip will yield almost five million views. At this point, his unusual career extends beyond the videos. His calendar is starting to fill up with performances and appearances ranging from local pet events to the SXSW festival in Austin. In April, also under the I Am Moshow moniker, he released a six-song EP. Even as the Moshow juggernaut rolls along, widening out to additional opportunities and forms of success, he’s still very much a man devoted to cats, and their welfare. His videos often communicate a pro-adoption or anti-declaw theme. Last year, he produced and starred in a video for the Oregon Humane Society, promoting adoption—and achieving significant results. “Don’t quote me exactly,” he cautioned, saying he believed all the cats featured in the video were adopted, and some 125 more found homes in the ensuing weeks. Not long after this interview, he was scheduled to make a similar video for an Oklahoma shelter. If just about anyone else uttered words along those lines, it would probably seem unforgivably grandiose. Coming from Moshow, though, it sounds just right. About the Author: Combining his passions for animals, radio, journalism, music and comedy, Duncan Strauss launched Talking Animals at KUCI in California in 2003. Since late 2005 the show has aired on Tampa’s WMNF. Producer-host Strauss lives in Jupiter Farms, FL, with his family, including four cats, two horses and one dog. He spends each day talking to those animals, and maintains they talk right back to him, a claim as yet unverified by credible sources.